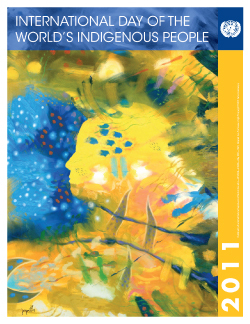 August 9th is observed each year as the United Nations’ (UN) International Day of the World's Indigenous People. This was the date when the UN Working Group on Indigenous Populations of the Sub-commission on the Promotion and Protection of Human Rights had its first meeting in 1982. According to a UN Report, there are over 370 million indigenous people in at least 90 countries around the world, many of whom are threatened with extinction and assimilation. To this day, many nation-states still operate with an archaic and colonialistic treatment of debasing the humanity and status of indigenous people as ‘primitives’, ‘savages’, or ‘uncivilized.’ Indigenous communities are, more often than not, subjected to systemic discrimination, exploitation, political and economic marginalization, exclusion from political and economic power, poverty, illiteracy, displacement due to wars and environmental disasters, dispossession of ancestral lands, deprivation of resources for physical and cultural survival, and seizure of their basic human rights. Here in Canada, our Aboriginal sisters and brothers are still confronted with the same frame of systemic discrimination, exploitation, marginalization, poverty, dispossession of ancestral lands, and deprivation of basic human rights. The Harper government continues in blatant fashion to disregard and stall their indigenous rights – rights that are clearly stipulated in the UN Declaration. Canada needs to walk the talk. Together with our Aboriginal sisters and brothers, we are demanding the Harper government to genuinely change its attitudes, policies and relationships and to implement UNDRIP now. Our work as Canada’s largest and most progressive private-sector union carries on as we support our indigenous sisters and brothers. Our community partner, First Nations Child and Family Caring Society of Canada (FNCFCS), needs our collective strength for their projects such as Shannen’s Dream and Jordan’s Principle. As part of the UFCW family, let us demonstrate our joint position by signing up for their I am a Witness campaign. As trade unionists and social justice activists, we must persist in increasing our understanding of the challenges facing indigenous communities while being mindful of the indigenous culture, tradition, and heritage that are intrinsically embedded in the fabric of Canada.